Where are the single female home buyers ? Dual-income couples are a major factor in the nation’s housing market’s recovery, according to the latest numbers from the National Association of REALTORS®. According to recently released 2012 Profile of Home Buyers and Sellers, married couples with dual incomes now make up 69 percent of all home buyers. That’s the highest percentage this group has claimed since 2001. At the same time, only 16 percent of recent home buyers were single females. That’s this group’s lowest percentage since 2001. 65 percent of recent home buyers were married couples—the highest share since 2001. Conversely it was the lowest share of single buyers since 2001. 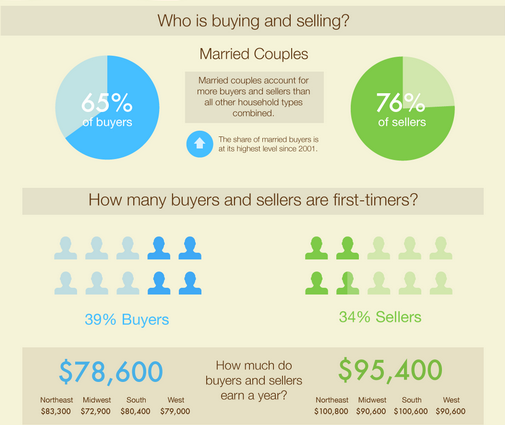 Two years ago, just 58 percent of buyers were married. For most home buyers, the purchase of real estate is one of the largest financial transactions they will make. Buyers purchase a home not only for the desire to own a home of their own, but also because of changes in jobs, family situations, and the need for a smaller or larger living area. Here are a few other highlights from the latest report. 39 percent of recent home buyers were first-time buyers. That is up 2% from last year, and only one point away from the norm. 79 percent of buyers said that they used the internet frequently during the search process, a little more than the 74% last year. In 2003 that number was only 42%. The typical home buyer searched for 12 weeks and viewed 10 homes—a decline from 12 homes in prior year, which speaks to the tightened inventory in many areas. 89 percent of buyers purchased their home through a real estate agent or broker, similar to last year’s report—a share that steadily increased from 69 percent in 2001. 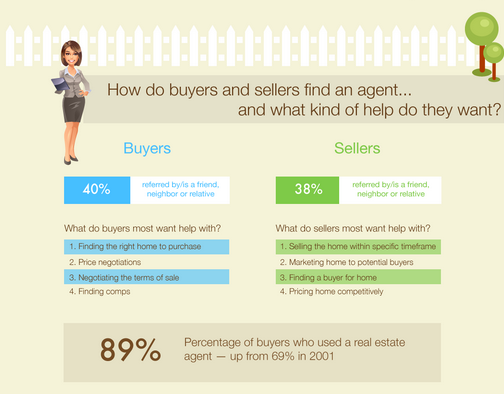 88 percent of home sellers were assisted by a real estate agent when selling their home. 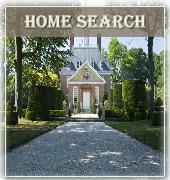 Buyers use multiple sources of information in the process of looking for a home. Far and away the most used sources are the internet (90%) and real estate agents (87%). What is the third most used information source? Yard signs (53%). Multiple Listing Service (MLS) websites were the primary source of information for buyers who used the internet in their search process. 54 percent of those buyers went to MLS sites. Of course, many went to a variety of different sites. 51 percent used Realtor®.com, 39% went to real estate company websites, and 47% went to sites hosted by individual agents. Aggregators such as Zillow, Homegain, and Yahoo were visited by 27% of buyers. Despite all the buzz about using social networking sites like Facebook and Twitter, only 1% of buyers used them as a source of information about available properties; and only 1% used video hosting sites such as YouTube. The differences in a decade are fascinating. In 2001, 48 percent of buyers learned about their home through a real estate agent, and only 8 percent found their home on the internet. This year the information 47% of buyers found their home in the internet. Print media is almost dead . In 2001, 7% of homebuyers found the home they ultimately purchased through a newspaper ad; in 2012, it was only 1%. Less than 1% found their home through a home book or magazine. Some 30 percent of buyers said the biggest reason people buy a home is the simple desire to own a home of their own. That included 60 percent of first-time buyers. The next biggest reasons for buying were desire for a larger home, cited by 11 percent of respondents; a job-related move, 9 percent; a change in family situation, 8 percent; and the affordability of homes, 7 percent. The report also mentions heating and cooling costs, and the financial burden of commuting, as top factors for 87% of home buyers.